Antonio Xavier Trindade was one of the important painters trained in the earlier batches of Sir. J. J. School of Art. Trindade was born in the Asnova village in Goa in 1869 and had his childhood also there. He Joined Sir. J. J. School of Art at the age of 19. He was possibly junior to M.V. Dhurandhar. After completion of his training there, he was appointed as a teacher in the same school. Like all the painters who were trained in J. J. School of Art, Trinbande too was expert in handling pencil, charcoal and watercolour as well as oil painting. Portrait and landscapes were his favourite subjects while he was a student he started getting prizes in the exhibitions of the Bombay Art society. In 1892, he won a silver medal for his head study and thereafter he won several prizes in Bombay Art Society’s annual exhibitions and by that he proved his mastery in handling various mechanisms in painting. His paintings with pastels and water colours were admired by the critics whole heartedly. The Bhavani Museum in Aundh has a portrait of an old man which proves his expert handling of water colour. While his portrait of a Marathi lady shows his mastery in handling oil colours. His skill in showing the Indian body-colour and its exact tone is revealed in this painting. 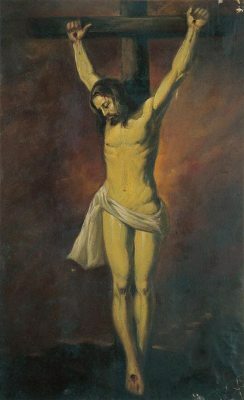 This panting by Trindade is preserved in the collection of Sir. J.J. School of Art. The critics specially admired the painterly quality in his painting. His handling of oil painting, shows free handling and bold brushing. Moreover his paintings and especially his portrait shows an unusual harmony in the colour scheme. His daughter writes that he was referred by the Art Critics as ‘A Rembrandt of the east’. Trindade gradually became famous for his portraits. He was already popular amongst the students. It was due to this he had some enemies in the art school. It may be because of that he was transferred from painting Department to the reay workshop which had no relation to Trindade. However, it was shown that he was promoted on the post of superintendant in the Reay Art Workshop. His salary was raised from Rs. 50 to 150 due to this promotion. Trindade being modest and good nature, never complained about this transfer and continued his work. The year 1920 showed the highest acknowledgement of Trindade. He won the Gold medal of the Bombay Art society for his painting flora. This painting showed a reclining lady, for which Trindade’s wife posed as a model. The panting shows spontaneity and a rich flesh-tint which has the quality of its own. It seems that the French artistic circles regarded him as easily the most inspired colourist of this country. Trindade’s other famous paintings include ‘Lady with Jar’ preserved in the National Gallery of Modern Art, Delhi as well as ‘A scene from Bombay’ and ‘Fiddler’ with a pleasant grey colour schemes and portrait of ‘Ambika’ Dhurandhar’s daughter in the some museum. Trindade was fond of painting some still-life, a pad or pan in his portrait. As a person Trindade was a simple minded soul. He was never practical and particular about money matters. It was his wife who was shrewd and so saved money so that after his retirement he could have his own bungalow at Mahim. He named it as ‘Cassa Blanka’. As his house was nears the Mahim creek, Trindade could easily go to the sea-shore and paint landscape. He was very happy with his own painting activity. The student also freely went to his house and watch him engrossed in painting. However, soon his diabetes started troubling him. He had a wound in his leg which could not be cured and that leg had to be amputed. Trinadde still with his one leg went with his servant to the seashore for painting. One day engrossed in his painting he tried to go back to see his painting from a distance and fell down and his other leg was injured. Thus his painting activity was limited in his own studio. The last picture he painted was ‘Ecco Homo’ i.e. the Christ with a crown of Thorn. Possibly he compared himself with the agony of Christ. Trindade died on 16th March 1935.